Answering the question ‘What makes a novel a classic?’ is a challenging task. What exactly is the common thread that brings a diversity of titles, from various genres and centuries, under this illustrious label? Although I’m sure that there are plenty of opinions on the subject, for me it’s something about the universality of a novel. Classics are those books that are able to reach us across centuries, from an entirely different context, and still have something to say about the condition in which we live. There’s a reach into the human experience – in a way that remains fundamentally unimpacted by technological advances, new fashions, and social changes – that traverses difference. It’s interesting to me that searching for ‘books I should read in my [insert decade here]’ will typically bring up various lists of either personal development or contemporary books. Not to invalidate either because I recognise the value of – and read – both. I think, however, that there is a neglect in recognising the incredible potential of classic novels – particularly those written pre-20th century – to inform the framework around which we structure our lives. The transformative power of literature will vary from person to person. Not everyone is receptive to the ways in which books can have a direct influence on how we look at and interact with the world around us. Yet, studies have shown that reading more literary fiction develops our capacity for empathy and compassion. To me, it’s about opening the door to the possibility that reading fiction – even and, in many respects, especially fiction written in a context so removed from our own – will have a tangible impact on the way that you live your life. It’s unlikely to offer that ‘everything has changed and I’m going to be a better person’ moment that you often get with self help books. But seeing the world through the eyes of others will subtly alter your perspective. For most of us, these subtle and unconscious changes are the ones that truly last. 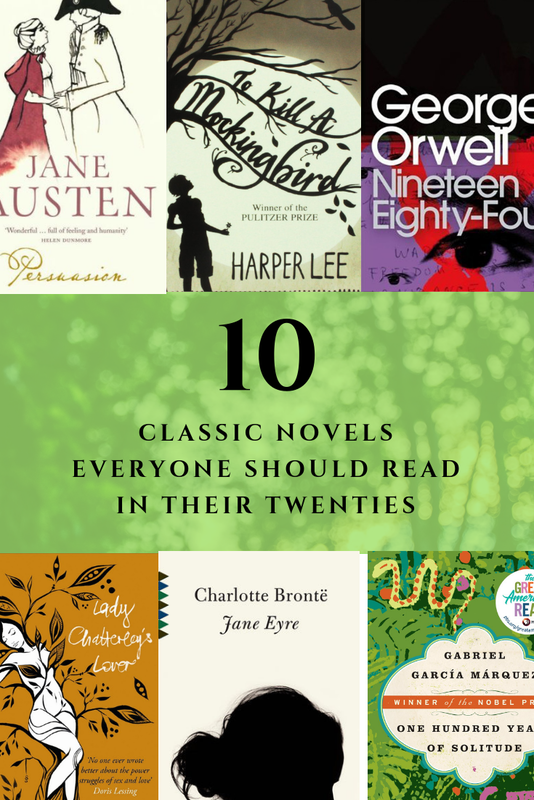 It is on this premise that I’ve put together my list of 10 Classic Novels Everyone Should Read In Their Twenties. Although anecdotal, based on my own experience, these are 10 books that I think have incredible potential for calming some of that mid-twenties chaos and laying a foundation from which you can address the many changes that tend to come with that transformative decade. If you missed Part One, you can read it here. Otherwise, we’ll get back to it! My first Orwell novel was Animal Farm, read way back as a teenager in secondary school. It was the first dystopian novel that I’d ever read and it began a love affair with Orwell that is still very much real. In many respects, Animal Farm is my favourite of George Orwell’s works. However, Nineteen Eighty-Four is undoubtedly his most provocative and important. It follows the story of Winston Smith, a worker at the Ministry of Truth in the totalitarian state of Oceania. The state is ruled under the ideology of Ingsoc and the leader Big Brother, around whom a total cult of personality exists. Winston’s work involves the revision of historical records to reflect the ruling party’s current ‘truth’ and removing any reference to those who have been deemed ‘unpersons’, effectively erasing them from existence. When Winston meets the mysterious Julia and begins an affair, he begins to question the way that society is being ruled and starts walking a path that brings him both closer to the truth and the danger of discovery. The predictive abilities of George Orwell, as he wrote this novel in 1948, have been thoroughly dissected. Yet it is undoubtedly the conformity of Orwell’s imagination with the reality of what the world has become that makes the novel such a remarkable work. While we have thus far largely avoided the western totalitarianism that Orwell depicts, you will certainly feel uneasy when reading Orwell’s vision alongside existing political trends. The power of this novel as something that you should read (or re-read) in your twenties is the centrality of objective awareness to the plot. Society’s willingness to blind itself served the purposes of those seeking power and, whether or not you agree that this implied permission is a present-day problem, it is surely the case that ignorance and democracy rarely support one another effectively. Nineteen Eighty-Four is a warning against complacency and a reminder that we all must play a role in facing even the most uncomfortable truths. We weren’t ever going to get through this list without a nod to magical realism. I thought that, just this once, I would avoid my usual trend of mentioning Isabel Allende’s The House of the Spirits and give Marquez a look in. He is, after all, considered by many to be the father of magical realism and its most skilled executor. One Hundred Years of Solitude is a novel of truly epic scope, following seven generations of the Buendia family in the town of Macondo, founded by Jose Arcadio Buendia and his wife. Reflecting the ways in which magical realism is often used to incredible effect to interrogate contemporary political changes, Macondo gradually finds itself exposed to the tumultuous and violent national politics dominating Colombia. The Buendia family become embroiled in the battle between political parties and the civil war that ravished the country for many years. Peppered with ghostly visits and a certain foreboding inevitability, One Hundred Years of Solitude is a truly magnificent read. Magical realism was, for me, the defining genre of my twenties. In many respects, therefore, it should be the genre at large that features on this list, rather than any specific title. However, One Hundred Years of Solitude is a seminal work and undoubtedly deserves direct credit for providing a framework that many novelists have successfully utilised since. While The House of the Spirits will always be my favourite work of magical realism, it is so clearly influenced by what Marquez was able to achieve. One Hundred Years of Solitude is such a feat of compassion, awareness, and imagination. Beyond this, I recommend magical realism to anyone in their twenties for the way that it truly expands perception. When executed well, works of magical realism are able to take the most mundane aspects of daily life and develop their meaning. Reading magical realism has transformed the way that I perceive the world. Although I’m not seeing apparitions or moving furniture with my mind, it has definitely taught me to see a little more magic in the everyday. For most, your twenties are a decade in which romantic relationships, and a preoccupation with them, feature pretty heavily. There’s typically a transformation from the heady jumpiness of your early twenties to the pressure and anxiety that tends to seize as more and more of your friends become permanently paired off in marriage. So what better place to turn that to Emily Bronte’s Wuthering Heights for an important reminder of exactly the kinds of relationships that you do not want. We follow Cathy and the orphaned Heathcliff as they indulge their ecstatically dangerous love for one another, damaging countless lives along the way. It is a story shadowed by the unpredictability and violence of the Yorkshire moors and cycles of revenge that bring almost everything to ruin. It’s difficult to summarise the plot of Wuthering Heights, largely because there are so many repeated names and overlapping relationships. If you’re prepared to wade through this, however, the novel is also one of the most powerful works of fiction I’ve ever read. It is an interesting contradiction of the types of relationships that so many of us are seeking out when we are in our twenties. There is, after all, an almost exclusive focus on finding ‘the one’ and experiencing that kind of all-consuming, ‘I’d give my life for this person’ kind of love. Wuthering Heights shows exactly that but in its darkest form. It’s interesting to me that so many celebrated quotes on love have been extracted directly from this novel. When I was searching around for bookish items that I could squeeze into my wedding, I can’t tell you how many things I found with quotes like “Whatever our souls are made out of, his and mine are the same.” It’s a wonderful quote but entirely divorced from its bleak context. After all, Cathy and Heathcliff’s relationship – as all-consuming as it is – leaves destruction in its wake. I’m not recommending this novel as a warning off of relationships and, inevitably, everyone who reads it will extract something different. It is, however, certainly a powerful take on what love can mean and become. I’m very aware that most people reading this list will be confused by this entry and, granted, I’m taking a bit of a liberty. Although Italo Calvino is not considered a classic novelist (and most people haven’t even heard of him), I’m using some predictive abilities in my certainty that Invisible Cities will stand the test of time and increase in popularity as time goes on. It was one of the most perspective-altering books that I read in my twenties and, I think, deserves a place on this list (it’s also my husband’s favourite book so it comes doubly recommended). While it does not have a plot in the conventional sense, Invisible Cities is essentially a conversation between the Venetian explorer Marco Polo and the Tartar emperor Kublai Khan. Polo is relating his travels to 55 different, fictitious cities, each described in vivid and beautiful detail. They read almost as parables and thought experiments (in a similar vein to Einstein’s Dreams by Alan Lightman), told in luxurious detail with moments of truly transcendental luminosity. Sometimes those books that we best loved in childhood end up having even greater meaning the older we get. Part of that is, I’m sure, the way in which they remind us of the joyful freedom of youth. Given how challenging our twenties can be, it’s probably no surprise that so many of us spend most of our time re-reading Harry Potter and recalling all of that truly regretful fan-fiction we used to write (or was that just me?!). One book that I found gained resonance as I went into my twenties was Louis May Alcott’s Little Women. This novel follows the March family, living in relative poverty in Massachusetts during the mid-1800s. The family – four teenaged girls and their mother, Marmee – are facing life while their father/husband is away, involved in the American Civil War. The story navigates the lives of the women, their relationships with one another, and the dynamics of their very different personalities. Little Women is, in many respects, a product of its time. It is often criticised for its portrayal of domesticity as necessary to women ‘coming into their own’. Any novel from the 1800s is, however, necessarily going to suffer from a somewhat archaic approach to gender issues. For the time of writing, Little Women is incredibly ahead of its context. In Jo March, the novel gives us a character who refuses to be constrained by traditional expectations. Her love of literature informs those around her and her approach to romantic relationships quite clearly contravenes the social paradigms that dominated in the mid-1800s. Most importantly, Little Women offers us a diversity of female characters, present and three-dimensional in their own right, without bolstering from male characters. It is a wonderful portrayal of female relationships and a representation of diverse personalities, owning who they are and refusing to compromise on that. As you pass your twenties planning your future, making important choices, and facing myriad pressures to conform, Little Women can certainly serve as a powerful reminder of how to stay true to yourself.